"This is what I use to season my hamburger patties before cooking them. It gives them a wonderful flavor that makes a so-so hamburger extraordinary." 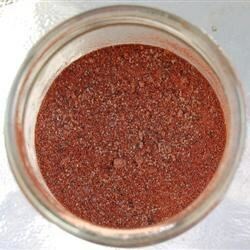 Combine the paprika, salt, pepper, brown sugar, garlic powder, onion powder, and cayenne pepper in an airtight container; seal. Shake to combine. Store in a cool, dry place between uses. I mixed 2 t. of the seasoning into 1 lb. of hamburger before making into patties. When cooking I sprinkled each patty with the seasoning. I plan on using on other meats too. Wow seasoning was amazing. I did add extra garlic and onion powder and it was superb. I broiled these and added swiss cheese during the last 5 minutes. A keeper for sure, thanks so much.